Inspired by Ian Dutton’s Guerilla Bike Lane, I started to think about other, more basic ways to separate drivers from cyclists in the city. 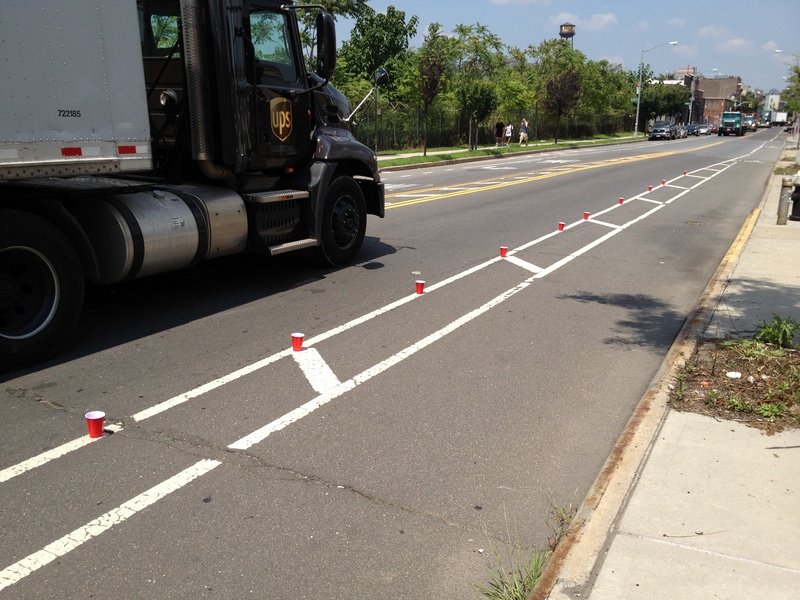 Plastic delineators are nice, and a row of parked cars is even better, but sometimes all it takes is very simple approach. 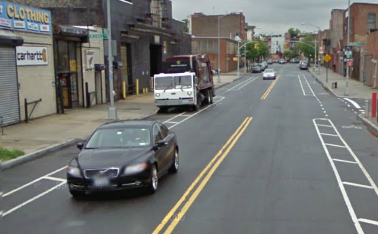 Some bike lanes can be separated from car lanes by little more than a raised curb and be quite effective. While such a design isn’t going to stop an out-of-control driver from crashing into cyclists or pedestrians, it can deter motorists from parking in the bike lane, with a few notable exceptions. The red color would make them more visible against white thermoplastic and black pavement. They could be easily driven over by a fire truck or other emergency vehicle. 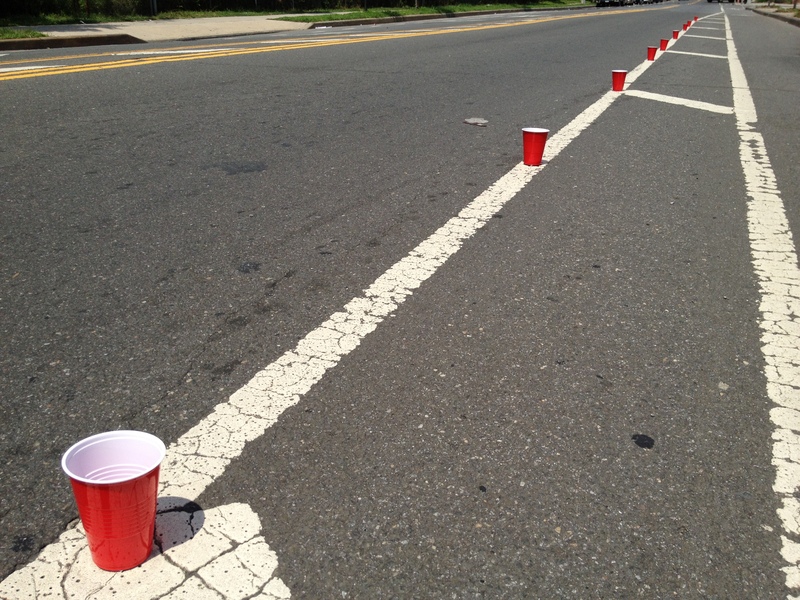 If hit by a car, the only damage would be to the cups. In fact, the cups seemed to be doing such a good job that one rider cruised by hands-free before tucking back down on his handlebars just at the end of the buffer. James Schwartz of The Urban Country had similar results when he and Dave Meslin of the Toronto Cyclists Union created the “Trashy Bike Lane” to show how a simple new street design could improve safety at a location where a pregnant woman had been crushed by a truck while on her way to pick up her son at school. After monitoring the bike lane for a little while and seeing no incursions by motor vehicles, I left to meet my friend. A more direct route to my daughter’s daycare meant that I didn’t take Franklin Street home, so I never got to check on the cups. I doubt they survived very long, since they eventually would have been crushed by a drifting driver, knocked over by a poorly executed bike slalomer, or swept up by a sanitation truck. 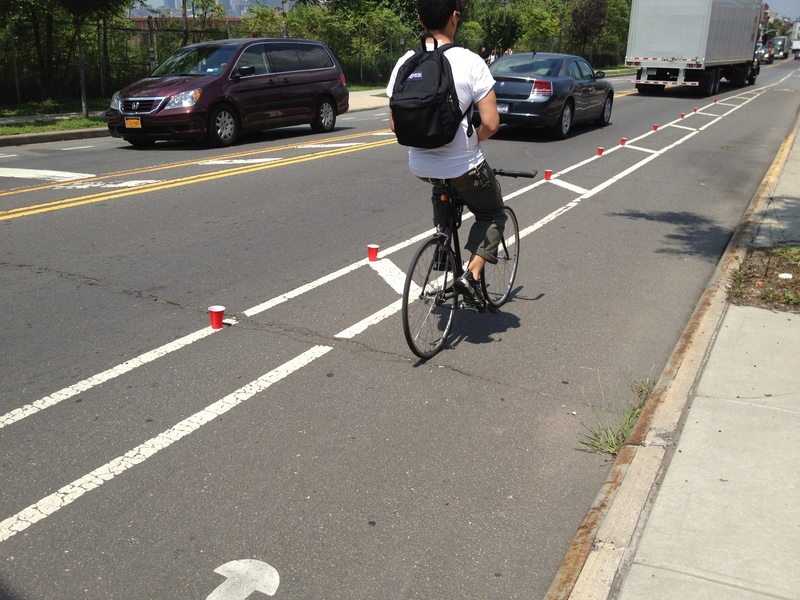 But while using red Solo Cups may inspire a few jokes about Brooklyn hipsters and bike lane versions of beer pong, my little experiment did provide at least a modicum of evidence that very basic forms of separation can make big differences when it comes to defining road space for different users. You didn’t “create” a bike lane here, what you did was demonstrate that raised lane markers were better respected than paint alone. I would submit this bit off “research” to your local DOT to request that raised markers be included in all future buffered bike lanes. True enough. I may have internalized some sort of urban-design-related existential angst: does a bike lane exist if a driver can park or drive on it? Ceci n’est pas une bike lane, I guess.